Bullet proof clothing is a class of protective clothing aims to protect the individuals from the bullets and steel fragments from hand held weapons and exploding weapons. Apart from defense and law enforcement security forces, commercial security is also one of the major factors driving the growth of bullet proof clothing market. Rising consciousness for commercial has significantly fueled the demand for bulletproof jackets, vests and tailored clothing to provide security to VIP personnel. Moreover, growing security threats is one of the factors due to which government is increasing the defense budget so as to enhance the security defense. 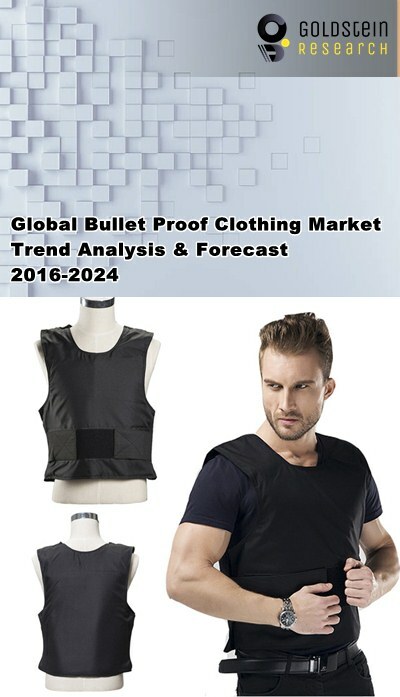 Goldstein Research analyst forecast the global bullet proof clothing market to expand at a CAGR of 5.4% during the forecast period 2016-2024. Further, the bullet proof clothing market is expected to reach USD 5.8 billion by the end of the forecast period owing to government funding programs and advanced technologies for the production of bullet proof clothing. The report covers the present ground scenario and the future growth prospects of the bullet proof clothing market for 2016-2024 along with the total revenue of bullet proof clothing industry in every region. We calculated the market size and revenue share on the basis of revenue generated per segment, regional and country level. The revenue forecast is given on the basis of number of bullet proof clothing manufacturers and current growth rate of the market. Based on end users, defense sector accounted for the largest revenue of 60% in global bullet proof clothing market in 2016. Moreover, civilian/VIP segment is one of the most lucrative and niche segment growing at significant rate with introduction of new technology and attractive clothing selections. Global Bullet Proof Clothing Market Outlook 2016-2024, has been prepared based on an in-depth market analysis from industry experts. The report covers the competitive landscape and current position of major players in the global bullet proof clothing market. The report also includes porter’s five force model, SWOT analysis, company profiling, business strategies of market players and their business models. Global bullet proof clothing market report also recognizes value chain analysis to understand the cost differentiation to provide competitive advantage to the existing and new entry players. Our global bullet proof clothing market report comprises of the following companies as the key players in the global bullet proof clothing market: VestGuard UK, Canarmor, Black Hawk, Aspetto, Miguel Caballero, Honeywell International Inc., E.L Dupont DE Nemours & Co., U.S. Armor Corporation., Wenzhou Start Co Ltd, MKU Limited, EnGarde, Infidel Body Armor, Point Blank Enterprises Inc., MARS Armor, Armourshield Ltd, BulletSafe, Compass International Corp. Ltd., Safariland and Ceradyne Inc. According to our global bullet proof clothing market study on the basis of extensive primary and secondary research, one major trend in the market is introduction of fashionable bullet proof clothing. There are very few companies around the world that design a range of fashionable bulletproof clothing for a variety of clients. Mostly these bulletproof clothing is supplied to the public as well as private sectors including the police force and VIP clients. These bullet-resistant clothing include jackets, raincoats, bulletproof vests, blazers and bulletproof suits as well. According to the report, major driver in global bullet proof clothing market is rising number of attacks and the growing violence and threats across the globe is pushing the rise in demand for the protection of soldiers and civilians, which will also contribute to the increasing adoption of bulletproof jackets in the defense sector as well as for security reasons for government officials and VIP’s. Further, the report states that one challenge in global bullet proof clothing market is high cost of the bulletproof vests and clothing. The price of these vests is higher majorly due to the implementation of costly newer technologies and improved quality of materials that are used in manufacturing of these vests. Geographically, North America region accounted for the largest market share of revenue in global Bullet proof clothing market and expected to dominate the market during the forecast period from 2016 to 2024. North America is closely followed by the Europe region, which occupied about 28% of the market share owing to presence of huge military and law enforcement up gradation projects. Developing countries such as China, India and Russia provide immense potential for the market growth owing to growing expenditure over defense sector.